Yesterday I had planned to have the students paint the outsides of our boats, but upon learning that we would have rain in the afternoon, we held off. The paint needs time to dry before being exposed to rain. So I went to pick up wood instead. Wayne Capp's sawmill prepared twenty-two 3/4 in. thick 8 in. wide white oak boards for my summer class in making Viking chests. They will be dried and planed to 1/2 in. thick before use. That wood is now stickered and drying in the ESSA wood working studio. The Viking chest class can be found online at this url: http://essa-art.org/workshops/iron/make-viking-chest/ There are still spaces available. In this class, you will make a wooden chest, and under the guidance of blacksmith Bob Patrick make the hardware for it. After two days of woodworking, and two days of forging iron, all the students will come together to finish the chests. I am writing reports for my students' spring conferences at the end of the week. I am reminded of the Harvard University concept, "Studio thinking." It is a term that fits well, what my students love in wood shop. Studio thinking is described at Harvard as the foundation for the arts and sciences. It involves direct exploration of both mind and physical reality utilizing the tools and materials at hand. 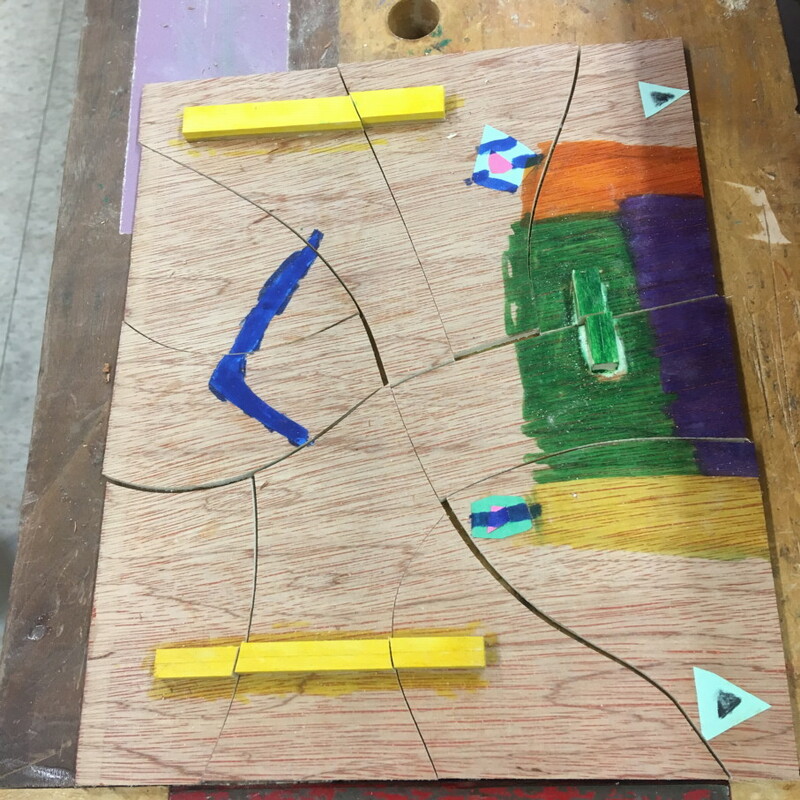 While my students carry home a seemingly endless stream of wood working projects, the real product is something that happens within the mind and heart and hands of the child. What we hold in our hands is who we are. Hold a hammer you're one thing. Hold a gun, you're another. I prefer hand planes, chisels and other finely crafted tools that allow me to make useful beauty. Is there anyone at the NRA or in the Congress capable of understanding that? The photo shows a simple way of marking the waterline on a Bevins skiff using a cardboard box and a flat carpenter's pencil. 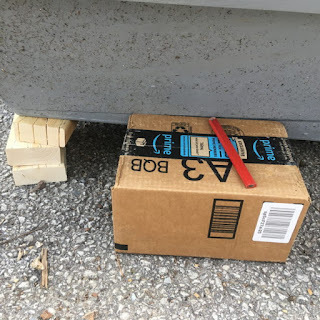 The box and pencil slide along the ground to mark a straight line. We began painting the Bevins Skiffs by applying a coat of urethane enamel to the insides. Applying paint to the outsides will begin today. The students chose the color schemes for each boat. One boat is to be painted two tone on the outside, and so a "waterline" will be taped off. How can one draw a straight line all around a boat at a consistent height? I've thought long and hard about this and came up with a reasonable technique on my own. Prop the boat up at both ends so that it is level in relation to the ground. Cut a block of wood to a length representing the distance that the line should be from the ground and use it as a guide to mark a pencil line all the way around. A flat carpenter's pencil works best. Apply masking tape to that pencil line. 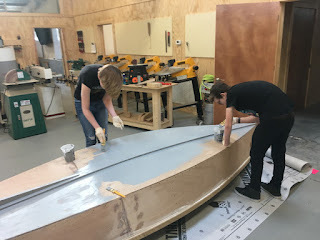 The masking tape will guide the application of paint, and the line will be straight all around the boat, from stem to stern and across the transom. This may be the same approach used by others, but not knowing how they would do it, I've had the pleasure of coming up with it myself. The high school students of America continue to call "BS" on our politicians over the gun control issue and whether or not our society can be made safe. Most of those politicians are so deeply nestled in bed under the covers of money with lobbyists from the NRA that they refuse to be awakened to the fact that the government is a tool through which real people should be served and through which society can be made safe. In making the Bevins skiffs, we started with scarf joints and the stems. The stems are important because they lead the boat in the right direction and push the bow wake to both sides. Our young people will be like that. The ranks of Democrats and Republicans alike will be cut through the middle and pushed aside if they fail to protect our kids. Yesterday I found my name mentioned in a column, by Dr. Richard Jagels in "Wooden Boat." Wooden Boat is a favorite magazine, because no other spells out so clearly the necessity of hands-on learning. Dr. Richard Jagels column is my favorite in that magazine because he writes about wood. explained why finding the center of a tree to be hollow is not necessarily the dead end of the story. He went into great depth to explain as you will find on Page 86 of the March/April, 2018 issue. There a very good reason for woodworking in schools. Or perhaps I should say there are a thousand of them. In the hands of a trained expert like Dr. Jagels, the life of a tree can be read like a book. And so humans and trees are similar in one very direct way. Trees tell their stories and we tell ours. Our own lives are inseparable from the lives of our forests and our trees, and so we might just as well learn to live with that and make use of wood working in the education of our kids. It's handy and offers benefits. The video of roughing out a bowl blank is of my friend Larry Copas, the gentleman who supplied us with Catalpa for our boats. I took the video of Larry at Saturday's turning session with the Stateline Woodturners at the Eureka Springs School of the Arts. Yesterday members of the Stateline Woodturner's Club, a chapter of the American Association of Woodturners, gathered at ESSA for a morning of wood turning. 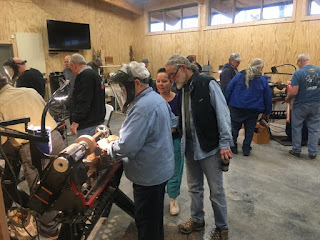 We had about 20 members present to use 10 lathes. Those who were not turning were helping others. All are in love with our wonderful woodshop, which I continue to polish and organize and prepare for summer classes. Most of the woodturners are of a certain age, by which I mean that very few very young people are involved. We know that young people have great need for the skills of mind that come from the process of shaping something from wood. When you stand at a lathe, you are not only shaping wood to new form, you are controlling your thoughts and shaping them in new dimensions. I am reading "A Forest Journey" (a second time) as it is about the rise of human civilization and its relationship to the forests. Much of what is now desert had at one time been lush forest, and all that we are now is the result of having conquered that resource again and again, building from it and burning it to the point that much of it is now gone and the land left barren. A Forest Journey begins with the epic of Gilgamesh ( https://en.wikipedia.org/wiki/Epic_of_Gilgamesh ) in which he kills the protector of the forest and enables the rise of man and of civilization. As our own story is so closely connected with that of our forests, engaging in the creation of something from wood is an excellent means to learn more about ourselves. When we shape something from wood, and do so with loving intent, for the purpose of creating useful beauty, we do more that simply make stuff. We become participants in the restoration of a human culture that shows respect for creativity, for the environment, and for each other. Teachers are responding to the idea of being armed at the following twitter page. https://twitter.com/search?q=%23ArmMeWith&src=tyah As you can see, they need help. But not guns. The fact is that teachers are drawn to the profession by their desire to make a difference in the world and in the lives of young people. They are frequently in the position of having to shelter children and their feelings from the challenges of the world outside that in ways large and small is failing them and falling apart. Children come to school hungry, angry, hurt, confused, and teachers have been tasked with either fixing those things or finding some way to get the lessons through despite the obstacles to learning that the world at large presents. Are we going to add to that a responsibility to bear arms? And to be trained in their use? It is difficult enough to get all teachers trained in CPR. The proposal that teachers be armed is incredibly naive. Or should I say stupid. Or shall I say evil. Even well-trained police officers are often incapable of performing adequately on the job. They have been known to accidentally kill innocent folks. I am disturbed by how the shooter in Parkland has been treated in the press and by the politicians in their comments. The call him a monster. They distance themselves from him without acknowledging that he's a monster of their own making. The shooter was a young man who fell through cracks. The cracks were held open wide for him to fall through and for others to suffer in consequence. And so how are those cracks held open so wide? They are held open by our government's refusal to provide a basic safety net of mental health care, and further by the refusal of corporations to pay a living wage, and by our refusal to acknowledge that we all, even the most high and mighty among us, have a responsibility to care for one another. One thing is for certain. We have a society in which many people think it is OK to care for our own children and not care one whit for others. The truth is, however, that all children are our children. As difficult as it may seem for some to adjust to the fact, we must circle them all up in our arms and care for them all as if they are our own, for in truth they are. That is our responsibility and the gift of being human. We must also acknowledge that the government of a caring people is to be used as an instrument of that caring. Yesterday my upper elementary school students wanted to make troll dolls just as had been proposed for my lower elementary kids. Children can be left to savor the innocent joy of their childhoods. Part of the parental challenge is to shelter them for that. Today I'll help play host to the Stateline Woodturner's meeting in the ESSA wood shop. The National Rifle Association and president Donald Trump are insisting that by turning our schools into armed camps we would solve the problem of violence in schools and in the lives of our children. What about the movie theaters, shopping malls, churches, concerts and other places where peaceful people congregate in joyful communion? Will we turn the whole of the planet into an armed camp, each person packing heat against each other? Schools in particular should not be further sequestered from their communities. Perform a simple experiment. Hold a stick in your hand and raise it above your head. Do you feel a sense of power from this simple act. Now imagine you are holding a chisel or a knife and applying its sharp edge to a piece of wood. Do you not feel the same thing? Now imagine you are holding a gun. You have the potential to point it at another person or (as ugly as this may seem), at your own head. Human beings are somewhat dependent on feelings of power and agency in their own lives. We become depressed and anxious when we have no control over things. Is it any wonder then that those who are anxious and depressed would be drawn to guns? Is it not reasonable to watch our guns closely so that they not be put in the hands of those who do not have legitimate use for them, and would it not also be reasonable to employ all in the use of real tools toward the creation of useful beauty? Both the Hindu and the American Sioux recognized the close relationship between the power to create and the power to destroy. Those powers are invested in the human hand. Those powers are multiplied by the tools (even as simple as a stick) that we've created. Should people be legally entitled to own weapons to bring down airliners? Should they carry flame throwers into their local shopping malls? Should they own bazookas and other effective arms designed only for killing folks? If you think so, perhaps you should join the NRA and fight for the unrestricted right to bear arms and insist along with them and the president that our schools become heavily armed camps. On the other hand, if you think we need education to take place in schools that are engaged in their communities instead of sequestered from community life, put real tools in the hands of kids. Engage schools and students in community life. Enable them to discover their power to create, not destroy. Today my high school students will help clean the wood shop at ESSA in preparation for a Stateline Woodturner's Group meeting tomorrow. Yesterday I delivered the boats to Clear Spring School. On television, we've watched again and again, the same thing. Folks use the second amendment and a "well-regulated militia" to justify owning weapons that have been used in the merciless slaughter of children. There is nothing well regulated about arms sales in the US, except that the NRA uses its political clout and campaign contributions to insure that American politicians do not interfere with the horrid stupidity of having 300 million guns in the US. As I've said before, hunting is one thing, AR-15's another. Geoffrey Canada, founder of the Harlem Children's Zone wrote a book, "Fist, Stick, Knife, Gun" that offers insight into the escalation of violence in American cities and schools. Form your hand in a fist and observe the feelings within your mind. Hold a stick in your hand and wave it in the air. You will feel a sense of power from such a simple thing. Take a knife in hand and track your imaginings. Then imagine you are holding a gun. You have the power to take your own life or that of another person with ease, and folks have the possibility of becoming infused with darkness of their own making. Sandy Hook Elementary School where children were killed five years ago is right down the road from Taunton Press and Fine Woodworking in New Town, CT. One of my editors from Woodcraft Magazine also lives in Sandy Hook. So, even here in Eureka, killings like the one at Marjory Stoneman Douglas High School last week are not that far away. Today, in fact, I'll review the layout for an article in Fine Woodworking Magazine, knowing that 5 years after Sandy Hook, life goes on, just as it has had to go on for those who've lost loved ones in such horror. I want people to read the Constitution of the United States and then explain to me why AR-15s and other similar weaponry should be allowed . We do not allow private citizens to own nuclear arms, or even bazookas and flame throwers. And so why should we allow any child to be put at risk by heavily armed gun crazed sick folks? And why should those sick folks have ready access to guns that even sane folks would never need except to kill others at rapid pace? I am in awe of the brave young people who have stood up to take the lead in the debate. The NRA and all those politicians who've been sitting on their hands and making excuses since Sandy Hook and Columbine had better wake up and finally do something to protect our children from violence in school. If not, they will be brushed aside and as a teacher, I will give thanks. Yesterday in wood shop at the Clear Spring School, my plan of having the first grade girls make troll dolls was quickly subverted. They turned the parts I had crafted into cats instead. That led to a cat show. Children in schools should be allowed time to be innocent, and teachers should be the protectors of that innocence. And not, as the president suggest, by carrying guns of their own. My students in 4th, 5th and 6th grades will travel around Arkansas later in the spring. Yesterday we made mineral collection tools for them to use for crystal mining in Hot Springs. The students are under orders to keep them at school so they will be ready for the trip, but that did not stop them from wanting to test them on our own rocks. If you've made something useful, do you not want to test it immediately in your own hands? I'm attempting to prove a simple point. If you've done real things in school, the artificiality of testing is not required. And if we gave students the opportunity to do real things in the first place, they would love their time in school. So what are the real things that students can be trusted to do that offer educational benefit? I'll not recite a whole list as there are some you will want to come up with on your own. I'll start with these: science, woodworking, music, and athletics. While waiting for the M-60 bus to LaGuardia on Monday, my daughter asked what the K-8 students in Finland do in Kindergarten and first grade since they don't begin reading in school until age eight. They learn woodworking, sewing, crafts, art, physical exercise and how to get along with each other. Finland ranks 1st in literacy among nations and allows more time for recess than any other European country. The US, despite the huge attention we give reading in schools and at such an early age, is tied for 7th. I am back in Arkansas today from New York City and have a whole lot of cleaning to do and preparation for classes. In the ideal school, students would be learning and testing what they learned in their own hands. In the typical much less than ideal schools of today, students are "taught" and then administered tests. The tests create anxiety, even through they are just made up as an abstract means to measure transference of information. In the ideal school, on the other hand, what the students learn is energized by student interest, and the testing is in their own hands as they challenge what they've been taught and test their own ideas in response. Those tests are anticipated with glee. All of this has to do with a balance. 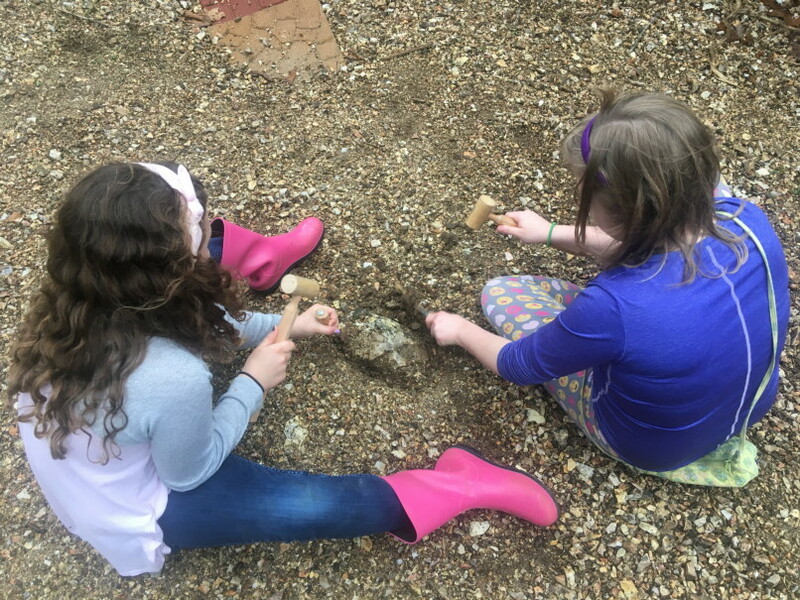 Froebel believed that each bit of information that went into a child's mind should precipitate an active response and we all learn best by doing real things. If you've taken time to observe your own learning patterns, you will know this to be true, even without being told by one expert or another. And so I must ask, "When will we find confidence to develop schools that work the way students best learn?" 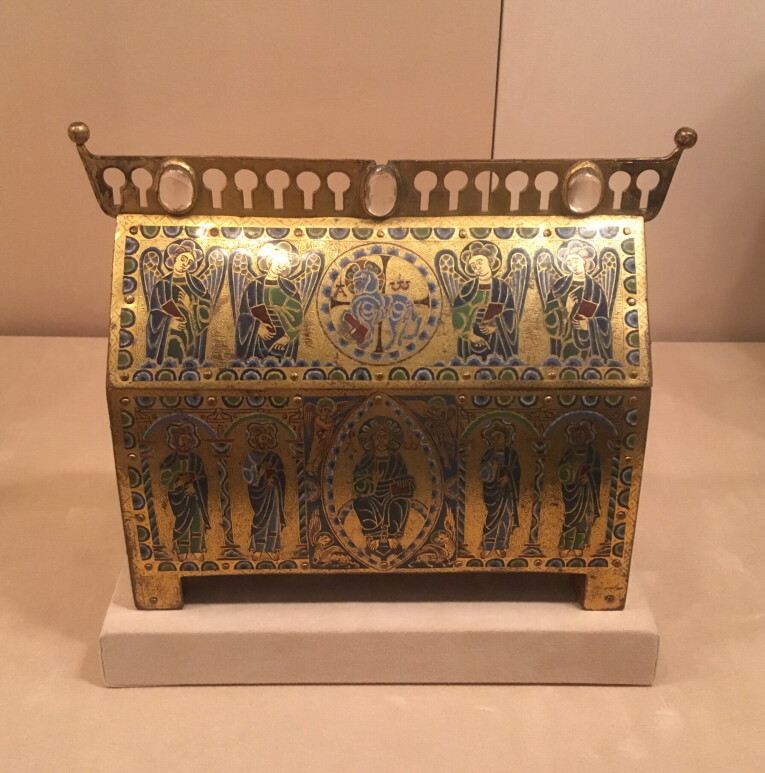 The small metal box in the photo, in a classic "reliquary" style, likely held small items of great value. I find objects like this to be inspiring. The box is at the Met. Yesterday we went to the Met. Today I am headed home to Arkansas. The image of Joseph the carpenter is from the Cloisters. In the museums I've been looking at things that are so wonderful and that no one of this day could make them without first investing their lives in the development of their hands and minds. All of the legislators in office since Sandy Hook should be held accountable for failing to protect our students from gun violence. Will you please join the student movement to force legislators to act in behalf of student safety? The American legislators did nothing after children and teachers were killed at Sandy Hook and will likely do nothing now unless it is demanded of them. While the image is claimed to be that of Joseph, you may notice the background shown in the image is of not of Roman times. Last night I mentioned my ideal to my daughter, that students in the great universities in the US put students to work in carpentry and stone carving as a means to assist the the forming the students' character, creativity and intelligence. Of course, my daughter is right. Parents would not stand for it. The idea of paying big bucks to engage students working deliberately with their hands would make no sense to those who've based their own terror of the trades. The funny thing is that industrial arts training in the US was launched in the 1870's because leaders at MIT and Washington University realized that their engineering and math students were lacking a basic foundation for their studies due to their not having done things that are real. 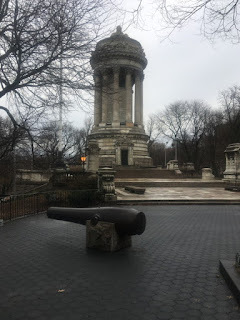 Yesterday my wife and I found our way to Staten Island and visited Snug Harbor, a complex of buildings that had served as a home for retired and disabled seamen and then as a national historic site became the home of a variety of cultural centers. The attraction that led us to Snug Harbor was the Noble Maritime Museum. A friend had wondered what we would find to do on Staten Island. I'd never been before and that's reason enough to make the free ferry ride. Ferries are certainly the best way to travel. 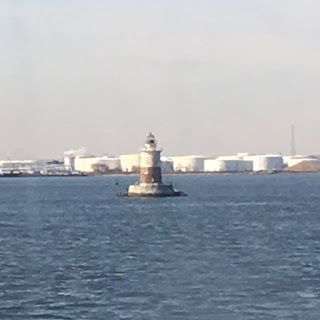 On the way across on the ferry, I recognized this small lighthouse, Robbin's Reef Light, the story of which is well told in the Noble Maritime Museum. The museum is the protector and defender of this light, and cherishes and tells the story of Kate Walker, who was keeper of the light for 33 years after her husband's death. 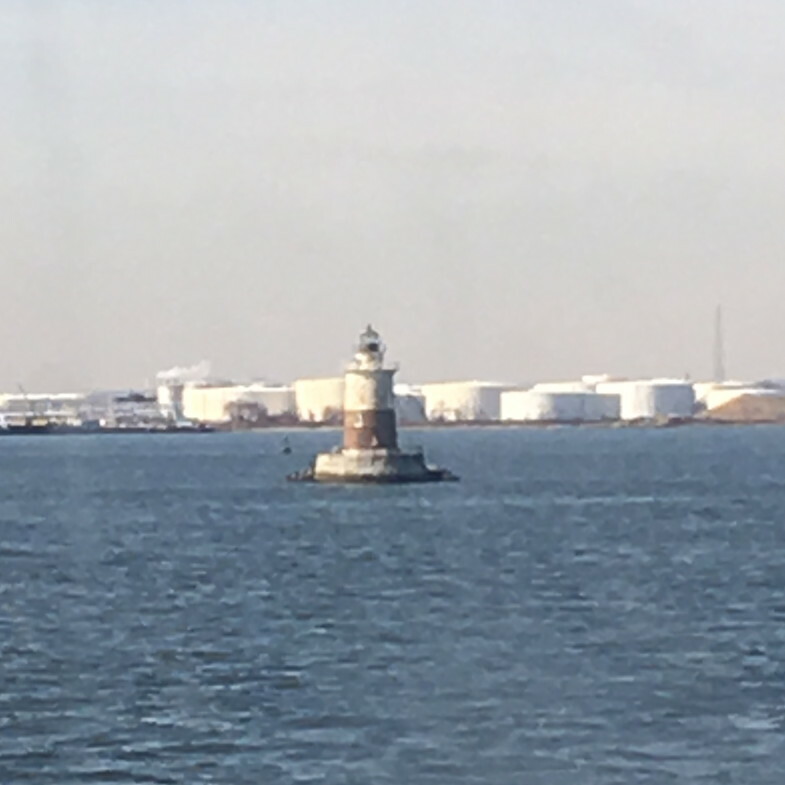 When the US Coast Guard, declared Robbin's Light to be surplus property, the Noble Museum stepped up with a plan for its preservation. It will be restored and maintained as it was when Kate Walker was keeper of the light. It is not as small as it appears in the photo, and has five rooms inside. New York City is a city made of stone. The photo shown is of the Soldiers and Sailor's Memorial on the Upper West Side. From the image you will not grasp the intricacy of the carved detail, but you can see the scale of the work. Aside from the great monuments, the same level of intricate craftsmanship was applied to buildings throughout New York City, and so while this is a city of stone, it was a city of craftsmanship at an earlier time. It makes one wonder. As the acid rain gradually erases the hand carved details, will there be craftsmen trained to build again and restore? Not likely. If we consider the role of craftsmanship in the development of character and intelligence, perhaps we could think of doing better in that direction. What I have in mind is that college students at the great universities in this lovely city, learn the arts of stone carving and woodworking as foundations for academic explorations. Today I am in New York City. Yesterday we flew from Arkansas and then visited my daughter's school, Harvest Collegiate, in Manhattan where she teaches high school chemistry and physics. We also met many of the wonderful young teachers with whom she works. It is different from the Clear Spring School in that we have a wooded campus, and their's is on the 4th and fifth floors of a building on 14th St. A party store is underneath, and unless you saw so many students coming and going from the site, you might never know a school was there. Today we will go touring in New York City. 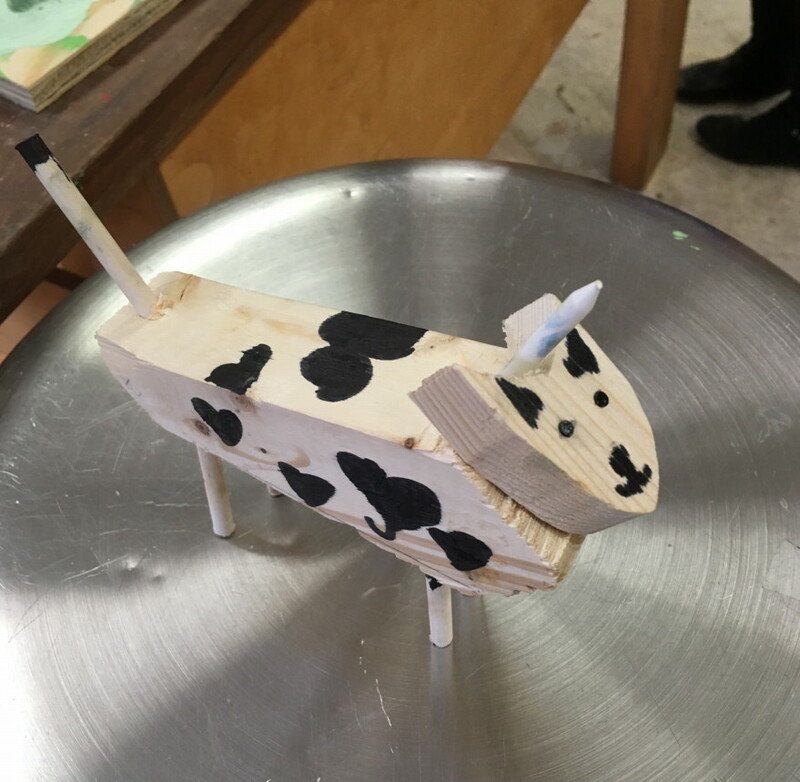 Yesterday in wood shop at the Clear Spring school the plan was for my first grade students to finish their toy unicorns. But then when a project is complete, they ask "what's next?" Whatever Might propose, they have ideas of their own. One girl asked, "Do you have hinges?" Going through my parts drawers, I found some. I had asked, how do you know about hinges? It turns out that her mother also likes making things. That's a good thing and explains why she has so many great ideas in class. The wood shop serves as a design laboratory as well as a way to integrate studies. So what was she going to make? She and a friend had made tuna fish (shaped like fish), salt and pepper shakers, plates, stove tops, and what else would be needed? A food truck. The hinges were needed so that it could open. Today my wife and I are headed for a visit with my daughter in New York. On the national scene, when will enough children be dead for the Republicans in Congress to offer something more than their moments of silence, prayers and condolences? How about a moment of legislation to fix things and make our children safe? "Put your hand here," she said, and even though the ground was bare, I could feel the growing of grass beneath, just where she said. So it is with life. One must be instructed toward some sensitivity for it to feel it and to recognize it even under winter's bare earth. But then that was a dream. Are there powers we've yet to understand? Our digital devices make a parade of all that. But then batteries die and life goes on. 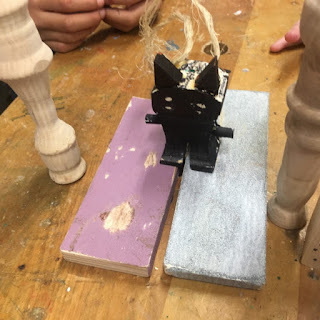 Today in the Clear Spring School wood shop, my middle school students will be working on canes, and my elementary school students will be continuing to make unicorns. Make, fix, and create. Let real life awaken your hidden powers. Yesterday my high school students finished priming the Bevins Skiffs in preparation for paint, and my first, second and third grade students made toy unicorns. I had planned to also give them the opportunity to make troll dolls, but ran out of time. That can come on Wednesday unless we get distracted. One student decided she wanted to make a caticorn instead of a unicorn. Who has heard of such things? Years ago, an old friend, Louis Freund was trying to get the city of Eureka Springs to preserve its Victorian buildings and homes by developing the whole city as an historic district. He argued, that while Colonial Williamsburg was (at great effort and expense) attempting to recreate an old town nearly from scratch, all the city of Eureka Springs had to do was preserve what we had. The city in response passed the necessary ordinances to preserve our historic architecture and Victorian charm that draws 750,000 visitors each year. One might apply similar logic to the education of children and recognizing the need for preserving their creativity. In American schooling we try endlessly to shape them from the ground up and stifle their natural development. We might instead, simply recognize and protect their creativity, and provide the circumstances for it to be expressed. Did you notice that the catacorn has heart shaped spots? Make, fix, and create. Establish the circumstances for others to learn likewise. to lead you must serve. 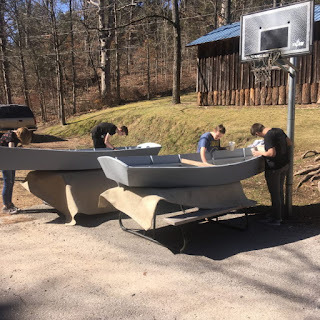 Today my high school students will paint the insides of our Bevins Skiffs with primer. We are closing in on the completion of the project. There are lots of steps to building a boat and at this point we've completed most of them. I ordered oars and oar locks even though some of my students have told me they would prefer that we make our own oars. We would run out of time before the school year ends, given the other things they and we need to accomplish. In the wood shop at Clear Spring School, my younger students will be making toy unicorns and troll dolls. There is an old Chinese saying embedded in the I Ching that if you want to rule, you must first serve. The truth of it may be witnessed in the flow of cardboard to and from the Chinese nation. They send us the things they have made, and we send them (along with hoards of cash) the used cardboard packaging so it can be recycled, remade into new boxes, filled and sent back for more cash. The balance of payments is enormous, and rooted in the decisions American policy makers have made for us. We would (they said) no longer need to compete as a manufacturing nation. We would be a service economy, flipping burgers for each other (at one level of the economy) while the top echelon, the wealthy elite, skimmed the cream from the trade taking place within and between nations. Enough of that. The hidden cost of having chosen to make nothing is the diminishment of mind. Around the world and in so many places we seem to have surrendered world leadership to the Chinese. Let's hope they do a better job of it and that we come to our senses. And speaking of the senses, the hands are the primary instruments through which intelligence is fabricated. How does this work? The eyes see, and the hands reach out to ascertain the truth of what the eyes have revealed. The hands then respond to test, measure, make and learn to serve others. Make, fix, create, learn from it, and pass the opportunity along to others so that they may learn likewise. Yesterday I cut the lids from plastic drums to enable their use at ESSA for collection and proper disposal of sawdust in the wood shop. The wheels installed underneath allow them to be pushed or pulled easily across the floor and out the door. The drums, recycled from industrial use, provide an elegant solution to managing sawdust. In both the turning studio, and machine room, we can make sawdust and shavings at a rapid pace. The translucent drums show the level of their contents, so they can be exchanged as necessary. 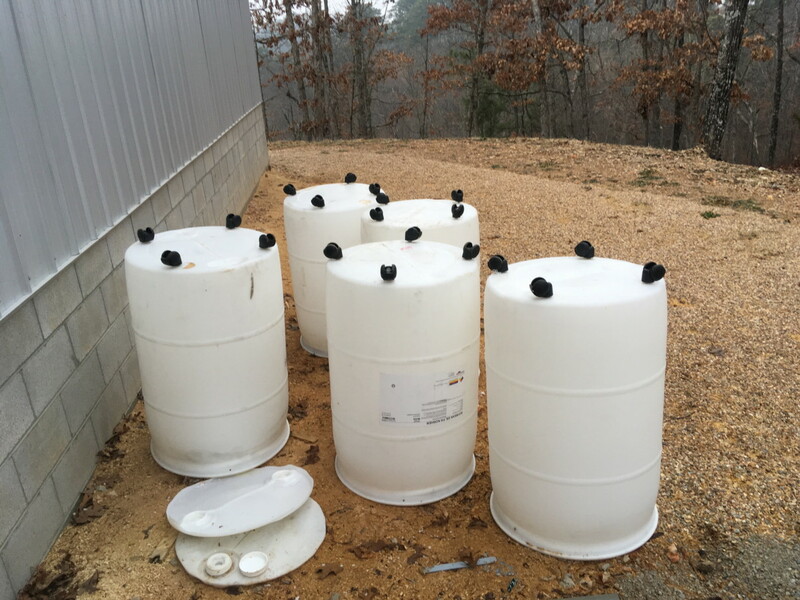 The drums will also facilitate the use of sawdust to build the soil on the ESSA campus. 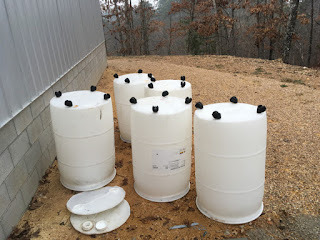 In the photo, they are upside down in order to drain the last bits of soybean oil from inside. In my home shop, I've returned to making drawers for small five drawer jewelry chests. We are having real winter weather in Arkansas, of the near normal kind like we had in the past before the effects of global warming became so pronounced. It is easy to fall into a digital coma and forget that there's a real world out there, were it not for the weather to remind us. A couple years back, I was caught in a local controversy when a major electric utility announced plans to build an extra high voltage powerline 75 feet from my deck. That got my hackles up. I joined with others to stop the powerline. With the assistance of the mainly passive National Park Service and the National Environmental Policy Act and sustained by the pool of outrage that energized our local community, we stopped the unneeded powerline in its tracks. We proved that a few folks with energy can stop corporations from running roughshod on the beauty of the Ozarks. In that case we were up against two major utilities and the full force of the Southwest Power Pool, and came up right. There is actually an even larger danger to the environment in that human insensitivity to it whittles away at it in very small slices each day. 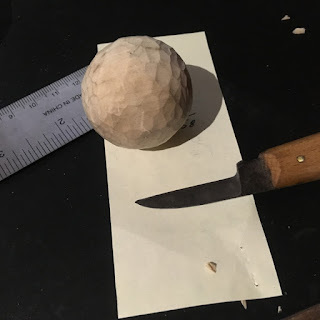 On my desk, I have a ball that I began carving at our carving club at ESSA last weekend. Going from a square cube to a near perfect sphere is a gradual process. The first cuts are made along lines I have carefully marked. But then the following steps are tiny, tiny, very tiny cuts, that are guided not by sight but by what I feel in my fingers. Where there is the tiniest bump, I apply the knife. Where will children (to whom we entrust the future of the planet) gain the necessary sensitivity to it if we do not expose them to it and allow it to educate them in its ways? And yet, we allow our children hours upon hours distracted from reality. Are we preparing them for a future in which their lack of sensitivity will allow corporations to do whatever they want? We began painting the Bevins Skiffs yesterday. In just an hour of painting time, we had the outside of each boat primed for the color coat. The students managed to avoid spilling paint, and also avoided getting it on their clothes. I had instructed them to work from the middle of the boat outwards. On Monday when we prime the insides of the boats, we will follow the same strategy. I am thankful to have use of the ESSA woodworking shop for this project, as the outside temperatures have been too low for paint. My fourth, fifth and sixth grade students used their wood shop time yesterday to make light sabers. In my own shop I have returned to building small five drawer maple jewelry chests of a design featured in my first book. 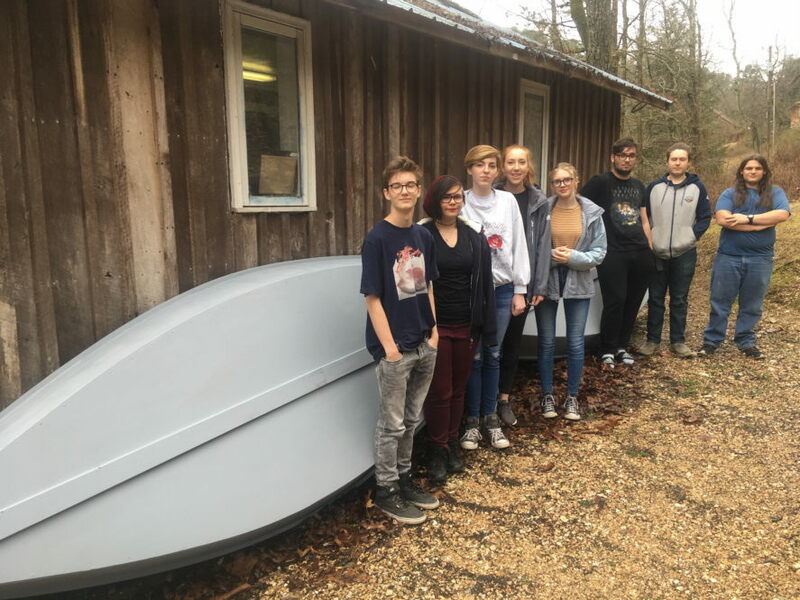 Today my high school students and I will begin applying paint to the Bevins Skiffs. I had planned to paint them when the weather gets good so we could do it on campus and out of doors. With continuing cold temperatures I made plans to do it at ESSA inside the warm wood shop. This will give us an earlier launch date. I have everything ready to go. The primer and paint are on hand, and new brushes and paint buckets are ready to go. I have tarps to lay out underneath. Nevertheless, I had anxiety dreams about it. In one the students were standing around talking and not working. In another, the paint was as thick as paste wax and I could not get it to brush out without thinning. Neither will be the case. Anxiety dreams are a good thing. They simply suggest that one is engaged with some level of passion in one's pursuits. The wooden ball is one that I carved last week at the wood carvers' club meeting at ESSA. Carvers from around the area meet here the first Saturday of each month. There were about 10 carvers from as far as an hour away and I was the least skilled of the bunch. The remarkable thing was that they all worked so quietly and and would drive so far to do with what they could do in their own homes or workshops with such quiet. It was a social experience in which all were working quietly instead of talking. Painting the Bevins Skiffs will be like that. There are mornings in which I find I have very little to say. It's not because there's not a lot going on. I try to keep my comments non-political because the wisdom of the hands is not political per se. Whether my readers are of one party or the other or no party at all, the hands are necessary to the making of intelligence and human culture and I choose not to go into all that's ailing me. I think a lot about what schools are for. One championship idea that stands out is that schools are to build democracy by equipping students with interpersonal problem solving skills and techniques and to equip them for real life by allowing them to do real things. Due to our failure to actually equip schools with teachers allowed time, training and experience in that, schooling is abandoned to less noble aspirations. The powers that be decided for a while that every child must go to college. Deciding that all children would go to college gave schools the excuse to abandon the dual track schooling in which some students would self-select for the trades and others would choose college prep. But then colleges don’t want to lower their standards to accommodate the uneducated and ill-prepared to join their ranks and they've required nearly 30 percent of those ill-prepared for college students to take remediation courses at their own expense, making up for what they either did not learn in high school or were not taught. So then those students spend (and have lost) big bucks even before they are given a chance to compete for a college degree. The serial effect of that is tragic. Students drop out, owing thousands of dollars they can barely pay on the low salaries they receive. My point is not that some kids should not go to college, but that all children should be better prepared for learning and for life by doing real things and by learning to get along with each other. The hands forge the crucible within which mind is formed. I would love for all students to go to college. College should be made affordable, and learning should be lifelong. Students should be granted credit for what they’ve learned in life as well as for the time they’ve spend seat-wise. I have all these noble thoughts about schooling. But we have schooling that's allowed too few noble thoughts, I’m afraid. 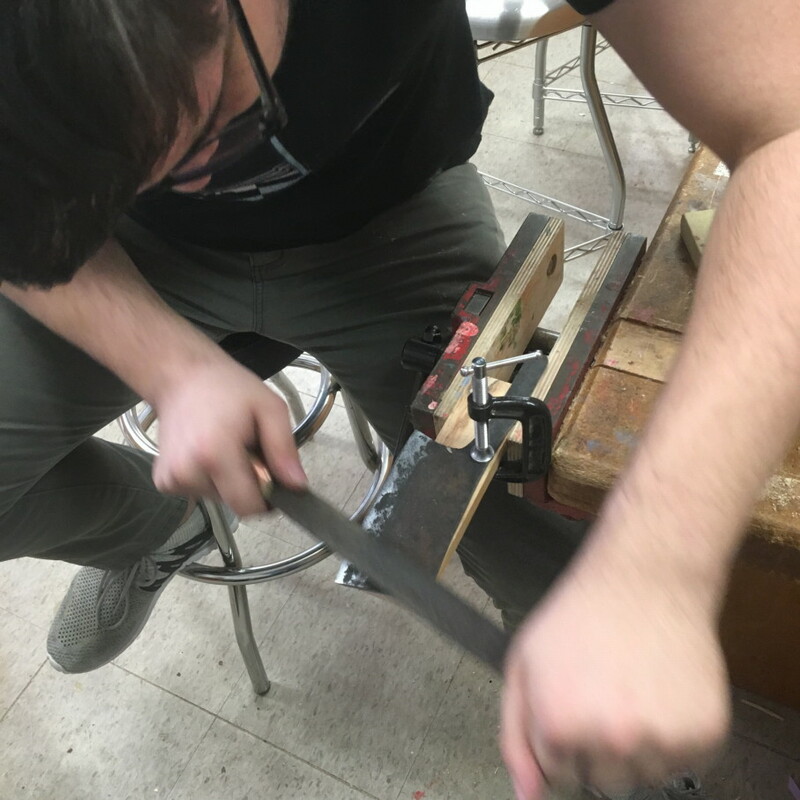 My student Ozric noted the huge array of sparks that came from the grinder as he ground the edge of the cleaver he'd hammered from an old lawnmower blade. That's carbon, he told the other students. "Huge efforts on the part of peasants and other workers were made to produce steel out of scrap metal. To fuel the furnaces, the local environment was denuded of trees and wood taken from the doors and furniture of peasants' houses. Pots, pans, and other metal artifacts were requisitioned to supply the "scrap" for the furnaces so that the wildly optimistic production targets could be met. Many of the male agricultural workers were diverted from the harvest to help the iron production as were the workers at many factories, schools, and even hospitals. Although the output consisted of low quality lumps of pig iron which was of negligible economic worth, Mao had a deep distrust of intellectuals who could have pointed this out and placed his faith in the power of the mass mobilization of the peasants." The program of Chinese backyard steel making was a complete flop, as was most of the Chinese Cultural revolution. Mao was a brutal dictator and irrational to boot. The Chinese backyard steel making was big news in the US at the time, as was American gloating when the program was abandoned. On the other hand, think of millions of backyard steelmakers being launched into experimental processes from which they learned through experimentation and failure. The hands are the crucible within which the mind is formed. In the photo, my high school student Ozric is making a steel cleaver as a demonstration art project for the study of World History. He used an old lawn mower blade as his source of steel. He heated it in his back yard forge and hammered it to shape and brought it to the Clear Spring School woodshop to finish into working kitchen tool. Given the state of things in our country, and in our system of education, we can use a cultural revolution of our own, in which we rediscover the value of the hands in learning and in the development of intellect. If we want smart kids, we can begin by offering them something interesting and compelling to think about. 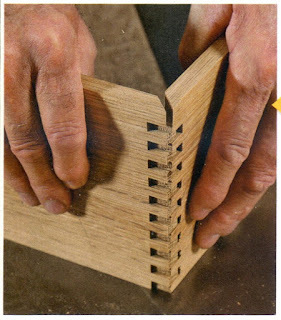 My article on making "box" or "finger" joints has come out in the April, 2018 issue of Fine Woodworking. In addition, an online article (finewoodworking.com) about how I cut the mitered finger joint shown in the photo will go live soon. I'll share a link when my editor makes it available to me. "Finger" or "box" joints were first used in the making of boxes for fine cigars. The joints then were called "locked" corners. The joint is known for its strength. The pattern at the corners of a box can be decorative, but also conveys a sense of lasting quality. As my article describes, with the right equipment and a jig you make yourself, the joint can be quickly and reliably cut. Taking the joint a step further, a miter can be formed at the top, giving it additional beauty and allowing decorative bands of contrasting wood to be inlaid into the top edge. The photo shows a demonstration finger joint cut when my editor Barry Dima was with me in the ESSA woodworking shop, and can be found on page 6 of Fine Woodworking #267. Make, fix, create. and assist others in learning likewise. This video series Building the TotalBoat dory features shipwright Lou Sauzedde. He is a very good instructor. The series is effective and worth watching, even if you never plan to build a boat. The point is simple. We learn by doing real things. So let's do something. You may choose to learn a few things first through a bit of instruction. It may lead to having some expertise of your own that you can share. In this particular episode, Lou scarf joins plywood while building a strongback for building dories. Other episodes show the designing of the boat on paper and the milling of logs to provide the material for building boats. An earlier season illustrates building a skiff. Make, fix, and create. Inspire others to learn likewise. "Today, it’s far easier and cheaper to find an ugly plastic container that will be filthy in a year, cracked a year after that and interred in a landfill a year after that, presumably for eternity. The same species that made that first basket eventually invented the machine that cranks out the plastic one today. That is progress, and it has brought our fragile world nearly to the brink." Perhaps we should re-consider. Can we go back and do over? On groundhog's day my wife and I watched the classic movie with Bill Murray and Andie MacDowell in which the lead character, a weatherman played by Murray is forced to relive his day over and over and over again until he finally gets it right. The film is funny, but serious also. We may be required to do the same thing. The interesting thing about making things is that we are making ourselves at the very same time. We miss that essential point. Is the making of oneself a thing that should be quickly and thoughtlessly done using the most shallow means available, or shall we take time in our own making? To abandon our traditional roles of making beautiful objects in service to humanity removes us from being recipients of that traditional sense of self in which we are the stewards of each other. Can we learn to care about each other? Can we learn to care out the planet from which we've all come? My fingers are crossed. "As for the hands, without which all action would be crippled and enfeebled, it is scarcely possible to describe the variety of their motions, since they are almost as expressive as words. For other portions of the body may help the speaker, whereas the hands may almost be said to speak. "Do we not use them to demand, promise, summon, dismiss, threaten, supplicate, express aversion or fear, question or deny? Do we not employ them to indicate joy, sorrow, hesitation, confession, penitence, measure, quantity, number and time? And how much more they cræft than all that. Quintilian was a master of oratory, founded a school of oratory and wrote a twelve volume book on rhetoric during the first century A.D.
On another subject, in reading Columbia College Today, the magazine for graduates of Columbia University and their parents, I found an article about a friend, David Heim, graduate of Columbia University '68 and Columbia Journalism '75. David was featured in the magazine for his wood turning and advocacy of woodturning. He is on the board of the American Association of Woodturners. I've only met David a couple times, but due to his sincere personal warmth I regard him as a dear friend. Make, fix, create, and increase the likelihood that we each learn likewise. In case you haven't noticed, there is a difference between schooling where you sit in a lecture hall, listening to a professor go on and on on some subject, and actual life which is infused with sensory information. Human beings are multi-sensory. We have arms, legs, hands, eyes, ears and bodies, that crave engagement in the real world, and schooling, rather than isolating us from the real world, could instead be designed to assist in multi-sensory engagement to simultaneously meet all learning styles for all students. Howard Gardner maintained that we learn in a variety of styles engaging various senses, and that most of us lean upon one sense more than others. 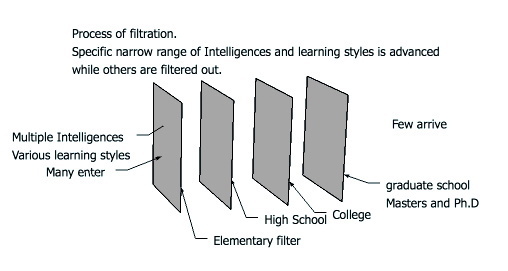 Gardner identified these as being particular "intelligences." Followers of Howard Gardner have attempted to follow a check list of learning styles to make sure that student needs are met. That forces the teacher to develop strategies that tend to feel artificial or contrived. Far simpler is to just do real things. When you work in a wood shop, all the senses are engaged, so let us use that as our example. You walk in the shop at Clear Spring School and first you smell wood. Then the rest of the senses fall into useful place, assuring the student of the reality of schooling and his or her reality in the educational process. Schools can become places of engagement and creativity, and the whole world needs that to happen. Small towns (and small neighborhoods) in the US have suffered from a strategy of extraction, through which the best and brightest students (measured by academic standards) are extracted and removed to a system of universities so that their talents can standardized and be hauled away. That may appear to be a good thing for the students involved, but is not so good for the communities involved. Having the opportunity for students to use the Eureka Springs School of the Arts as a degree pathway as we plan, will be a wonderful way to meet learning needs at home. It may also serve as an example of what all schools must become... places in which student's lives are shaped by doing real things in service to community. Yesterday in Little Rock I was part of a panel to select the 2018 Arkansas Living Treasure, an award from the Arkansas Arts Council that I was selected to receive in 2009. The award is granted on the basis of artistic merit, and service toward the perpetuation of traditional crafts, using a system of assigned points. We arrived at a unanimous decision that will be announced a bit later in the year. Yesterday our ESSA director, Kelly and I met with the head and selected staff members at the North Arkansas Community College to begin the process toward being able to offer our ESSA classes for credit toward degree. Our objective is to make a college education, particularly in the arts, available to people in our small town. We seem to be well on our way toward that goal. The interesting thing at this point is that distance learning can allow our local students to gain everything they need toward a college level arts degree except the studio experience necessary to get a degree in the arts. That hands on studio learning is available through ESSA, right here at home. For me, this will be the fulfillment of a dream. I have students in mind that may not choose to go away to school but can be lured onto the path of college graduation by taking classes at our Eureka Springs School of the Arts. The added benefit is that having young people on campus will bring fresh energy and a heightened level of creative joy for those of us in the over 50 generation. The thing about human beings of all ages is that we learn through play. Adults and children all learn in the same ways using multiple intelligences activated through play. University education should engage the same techniques as Kindergarten. Instead, many university students are crowded into lecture halls where they spend learning time removed from their most natural learning styles and checking their facebook accounts. 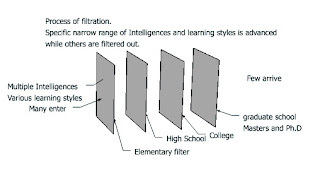 My simple illustration is intended to describe the way that various learning styles are filtered out during the process of advancement through educational institutions. Can you imagine an educational method that left creativity intact, and what it would mean to the future of humanity? That was Kindergarten. Today I have a meeting at the Arkansas Arts Council, then will go back home to Eureka. Make, fix, create, and extend toward others the opportunity to learn likewise. Mario Rodriguez is another Fine Woodworking writer who has started woodworking with kids, and his experience is described here: http://www.finewoodworking.com/2018/01/30/shop-tour-mario-rodriguezs-woodshop-classroom-curriculum on the Fine Woodworking website. A few more and we'll have a movement. Mario has long been a teacher of adults. You can tell from the interview that he's found equal or greater rewards in teaching kids. Today I go to Harrison for a meeting at North Arkansas Community College and then on to Little Rock for a meeting at the Arkansas Arts Council on Friday. When my 4th, 5th and 6th grade students learned that I'll be out on Friday they asked if they could have class yesterday instead, so we did. The students were all very happy to be in wood shop. 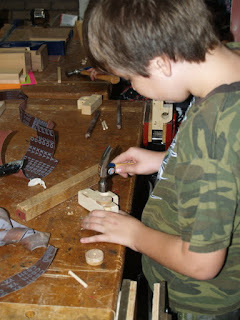 My students would opt for every day wood shop if I and my fellow teachers could manage it. 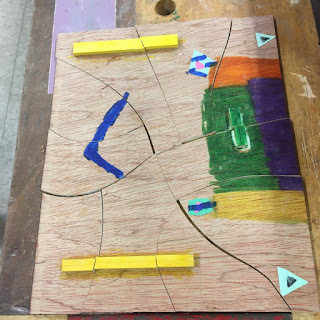 The photo is of a puzzle made yesterday by a second grade student. I had asked that they add other things to their puzzles to add interest. Colored papers and bits of wood were suggested. Aside from being a puzzle, I cannot tell you what this is, but the students have been taking them home in bags and challenging their older siblings and parents to put them together.